Camping with kids is as stressful as being blindfolded, while carrying a family of kittens, and being forced to run a marathon while people shoot paint balls at you. However, the camping process as a full story plays out like a woman in labor- it is terrifying, but is usually worth the pain in the end. Despite all of the terror and hard work, you don’t have a choice in the matter because you are the parent so YOU HAVE TO take your kids camping (bold words are based on my own judgmental opinion). You can do it though…hear me out. To start with, try to wipe away those memories of camping before you had children when you would take long romantic strolls by the river, sit by the campfire peacefully, go to the bathroom by yourself or sleep (at all). If you have any camping experience to base your expectations on, you are going to be severely dismantled the first couple of days. Try to forget your memories and slow down the train of expecting, because it will surely crash; but you may be surprised what you actually find in place of your dreamy ideas of a fun- filled easy summer week of camping. After I have packed a certain amount, I forgo the thought process of canceling because I’m in too deep now, I can’t go back on this decision. Once the bags are filled, the car is stuffed to the max, and the kids are ready to nap, it’s time to hit the open road- and turn around to go back home to get things we forgot (about 3 times on average). Once we get to the campground, or the mountains, the real stress begins because we tend to camp in places where reservations are not available. I despise camping 10 ft. from another camper; it’s so awkward trying to pretend to do normal life outdoors when people are staring at me- plus I am such a psychology freak I find myself wrapped up in trying to guess what the people around us are doing with their lives and I end up being the creepy neighbor camper. I want to be out in the trees, where I don’t have to worry about my neighbors, my kids peeing right outside of the tent in the middle of the day or my baby who screams all night sometimes. And who wants to leave their dog on a leash the entire week? How easy would reservations be though (hint: you should do this), I can’t even fathom pulling up to a site all ready for us. 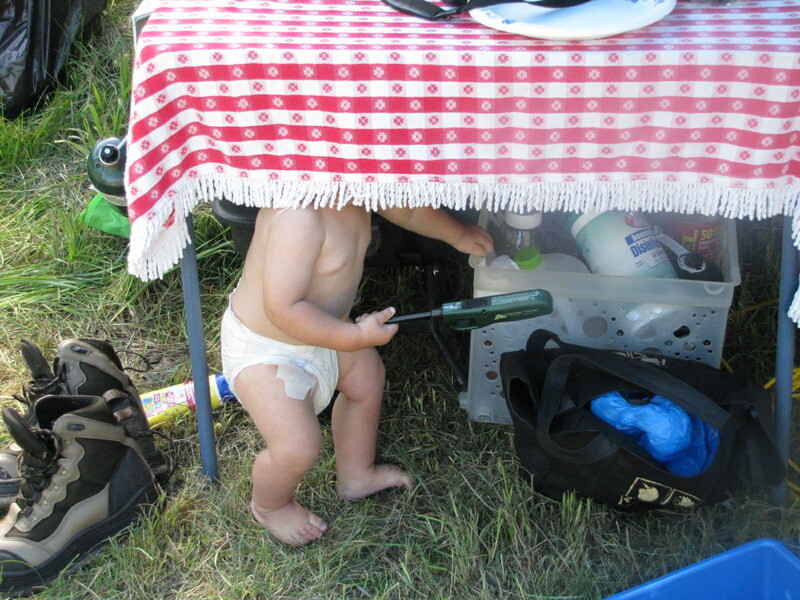 Instead, we drive around like stress bombs trying to find the perfect kid-proof camping spot. The kids are yelling they are hungry, the dog is whining because it sees the river, and it is always my husband’s fault that we can’t find the perfect one…I don’t know why, but it is his fault somehow (be prepared to argue with your spouse). *We build a fire but it turns into a game of chase with our 1.5 year old as he is trying to throw rocks into the flames. Thankfully we brought a bouncer to restrain him. The other kids are just as worrisome because they stumble around, back up towards, and try to burn sticks in the fire. It blows my mind that no one gets burnt. One kid usually ends up sick from marshmallow overload. We sing loud songs which scare off animals and torture fellow neighbor campers. *Sleeping is re-named ‘laying down’ because every time I would start to drift off, a kid would wake up and either cry about the dark, have to pee, or wonder if it was time to get up yet. And when one wakes up, the rest follow along shortly after. *Who’s idea was it to bring food that has to be cooked? Do I secretly get paid for doing dishes for 3 hours a day? *It seems like the kids have to use the bathroom 100x more than when at home…I feel like I spend 50% of my time taking someone to the bathroom. 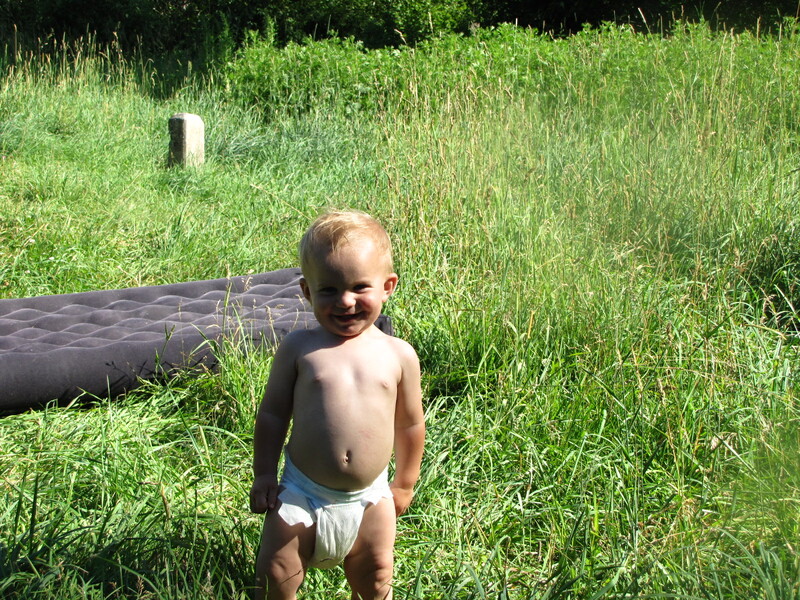 Don’t even get me started on the strange places I have changed diapers. *Can we make a cage or a fence for the toddler or will it traumatize him for life? He just unpacked everything we had in the cooler while I was doing dishes. He just dumped ketchup all over the ground and is painting with it. He just ran off into the tall grass and thinks it is funny to hide. He only slept for 15 minutes at nap time. He is like a little camp troll trying to be as mischievous as possible! *Day trips- we go to the river to try to float down on the air mattress, which turns into a scream fest as one of them thinks their sibling will be carried down in the rapids and so the other ones join in and cry too. The water is too cold. The sand is too dusty. The mud they play in will not be fully removed until we can take a hot shower at home. *Fishing- it lasts for about 15 minutes with the kids. The toddler throws the fishing pole in the water and it is lost…rendering another episode of freak out tears across the board. We both take our felt boots so we can haul the kids, the coolers and the umbrellas across the river to an island. This is about the time I slowly sneak away and head upstream to fly fish- leaving my husband stranded and stressed out on an island with three kids. I pay him back by letting him take a nap while I take the kids for a drive. Keep the team mentality- divided, you will be conquered. By the third day, we have got it down and we turn into a fine oiled machine with designated tasks and routines. The kids know what to expect and we know what not to expect; ready for any sort of situation to arise. Once we get past the terrifying state of wondering ‘why we are trying to live outdoors’, we realize the most important thing we get to do: be together. After all of the chores are done and the kids are wrangled in, we all get to just spend time doing nothing, which ends up being a time to tell stories, be creative with nature and put our full attention towards our kids. Camping is also an important time to re-evaluate life ‘in the real world’ and take a step out to see if you are truly living the way you want to, spending the correct amount of time with your kids, and making fun things like this a priority. Maybe it is from the exhaustion or the idea that packing up is going to be impossible, but whenever it is time to leave, I always try to find a way to squeeze another day from the calendar. The stressful day trips have become opportunities to explore fresh ways of having fun outdoors. The insanely dangerous campfire time has become a moment to sing and be silly together. The cooking and dishes time ends up being a group task that we accomplish together, making us a tighter family. The times spent walking to the bathroom are times we visit and speculate about what the animals around us are doing. 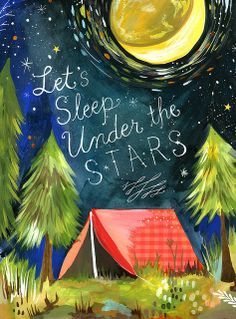 The sleepless nights give us a chance to notice the stars, make up stories, see the deer grazing at daybreak and help us appreciate our beds at home. Our kids NEED this time with us. They also need time in the outdoors to learn that they can interact with trees, animals, mud and rivers. It is a perfect way for a kid to build confidence in themselves too- learning how to build a fire or catch a fish is empowering! Not showering and being held to a dreaded schedule is liberating. Eating candy and playing cards with mom or dad is something they will cherish more than you will ever understand! You don’t want your kid to be the one in therapy later saying his parents never took him camping because it was too much work! You want your daughter to be able to build a camp fire and your son to be able to do camp dishes confidently- skills they can pass on to their own kids later on down the dirt road. Minimize your expectations and maximize your playful spirit- and you will end up giving your child something money could never buy them! It’s more rewarding than running a marathon while holding kittens… and it’s easier than child labor….believe me. You are a hardy mama and I’m impressed. I can hardly survive a night in a hotel if the ice machine is out of order and I have to go to another floor. Haha Thank you! Don’t get me wrong, some days I am in the same boat!